“A Holiday Benefit, Vol. 4” Silent Auction Is Open! Tonight (December 16th) we celebrate the release of “A Holiday Benefit, Vol. 4,” our annual “A Holiday Benefit” for 826NYC, at Rockwood Music Hall. Chris Abad, Bryan Dunn, Casey Shea, Charlotte Sometimes, Dave Pittener, Kelli Rae Powell, Rachel Platten, Wes Hutchinson, Zach & Sarah and I will rock your holiday socks off with a hosting assist from NY1’s Roger Clark and comedian Negin Farsad. “Holiday Benefit” Box Set – Four years of “A Holiday Benefit” awesomeness! Forty-nine songs in four volumes, featuring holiday hits from Bess Rogers, Amber Rubarth, Paula Valstein, Emily Easterly, and more. Minimum Bid $50. Benjamin Wagner Song – Singer/songwriter Benjamin Wagner will write and record a song just for you! You can do everything (write and sing) or nothing at all! Then he’ll deliver it on a CD with custom artwork! Opening Bid: $100 (solo-acoustic) or $500 (full-band). 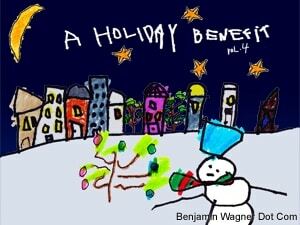 You can download “A Holiday Benefit, Vol. 4”, “A Holiday Benefit, Vol. 3”, “A Holiday Benefit, Vol. 2” and “A Family Holiday” on iTunes now!